Accumoto Motorsport continues valuable research and development in it's partnership with VW, Audi and Porsche tuning firm APR at the Nurburgring. Accumoto principle and test driver Mark White's view on driving the Nordschliefe; "It is a such a great opportunity to mix business with the pleasure of being able to test on the most famous race track in the world! One lap around this place incorporates every essence and nuance of all of the road courses in the states combined. Special thanks to Team Janica Racing, APR Motorsport and our friends Theo and Heidi from rent-racecar.de for making this possible! April 3, 2008 - The end of March was an exciting time for APR Motorsport drivers Randy Pobst, Ian Baas, Mark White and Dion von Moltke. The drivers, major team and driver sponsor "Team Janica Racing", family and APR Motorsport staff met up at the famed Nürburgring's "Nordschleife" on March 22. Two full days were spent driving what proved to be an often snowy "Green Hell", as the track is also known, testing components, driver skill and giving hot laps to the rest of the group. All of the drivers, with the exception of Dion von Moltke, had been to the Nordschleife in the past, but the over 14 mile long track required much familiarization and practice before any of the drivers were able to push virtually as hard as they do while racing in the Koni Challenge Series in their VW GTi race cars. On their second day, APR Motorsport was joined by famed "Ring" Taxi driver, Sabine Schmitz. Sabine has more laps on the "Ring than any other known driver, with a total believed to be somewhere in excess of 20,000 laps. She additionally is the only female in the world to have won two 24 Hour races, both having come on the "Ring". Sabine helped familarize the group with the dry and wet lines of the Ring, as well as other dangerous parts of the most difficult and challenging circuit in the world. Sabine's boyfriend, Klaus Frikadelli, with whom she races in the ADAC German Endurance series in a 4.0 Liter 997 RSR, joined the group, offering hot laps in his 2008 Corvette Z06. APR Motorsport hopes to have Sabine and Klaus as their guests this season, and we may even see Sabine in an APR GTi at some point during the season, if scheduling allows. The group, minus Dion von Molkte, who had to return to the US for mid term tests at his high school (yes, he is that young! 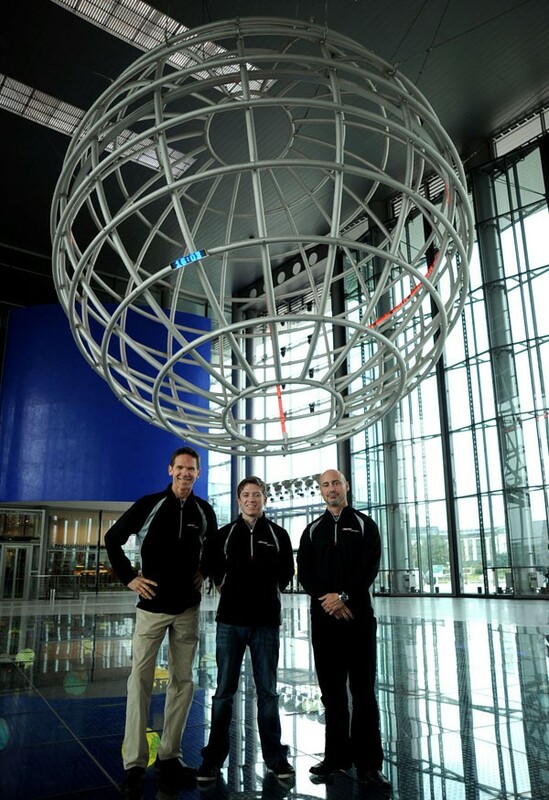 ), left the Ring only to head directly to the VW Factory, where they were the guests of VW AG. The group took a factory tour of the Wolfsburg, Germany plant, observing the assembly of not only the GTi's that they race in Koni Challenge, but also the Touran and Tiguan sport utility vehicles (the latter coming to America this fall). All were impressed by the technology and high standards and efficiency of VW's assembly plant. Randy Pobst said about the visit "Having toured the Porsche and other high end assembly lines, I was happy to see virtually identical construction quality on the VW's. The shear amount of design and engineering that goes into these relatively affordable cars is astounding. I really can't express enough how impressed I was!" Ian Baas added "To witness, first hand, all the design, quality and safety that goes into these VW GTi's is amazing. It makes you so comfortable and proud to be racing such well engineered cars." After the factory tour was over, the group dined at the VW factory and toured the famed "Autostadt", or "Car City", which is truly an automobile amusement park. Exhibition halls representing all of the VW AG marks are present, including Lamborghini, Bentley, Bugatti, Audi, VW, Seat and Skoda, as well as a fantastic auto museum, are all within walking distance in one large, sculpted campus.